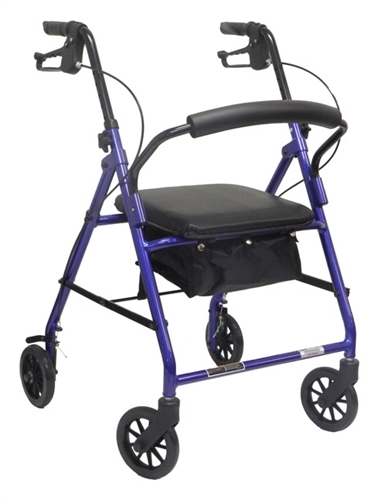 Seamless, padded polyurethane seat for improved comfort and ease of care. • Textured seat is waterproof and anti-bacterial. • Seat flips up and includes large, zippered compartment underneath for secure storage. • Padded backrest can be folded up or removed. 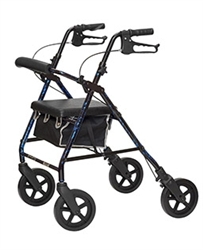 • 8” heavy duty front and rear wheels with 5 ribs for increased stability. • Durable, lightweight aluminum frame. • Easy squeeze locking loop brake system. • Handle height is easily adjustable. • Folds easily for storage and transportation. • Includes large pouch for additional storage. • Warranty: 3 years on the frame, 1 year on the seat. • Item Weight: 16 lbs.